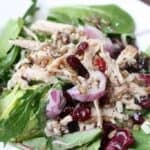 This simple copycat Kneaders Turkey Cranberry Salad is the BEST! Layers of lettuce, turkey, feta, craisins, and sunflower seeds doused in a sweet raspberry vinaigrette–it’s completely delicious! One thing I’ve loved about living in St Louis is, obviously, the amazing restaurants we have here! So many of them are family owned, quaint, charming little places with amazing food! You don’t see a lot of your typical chain restaurants in the city, which I love! Whenever we have date night we always jump on yelp to find the next restaurant we want to try. I don’t think we’ve been disappointed with a single restaurant we’ve tried since living here! Awesome BBQ, Italian food, Mediterranean food, sandwich places, custard shops and more. However, whenever I visit family in Utah there are a few chain restaurants I have to eat at, that they just don’t have out here! Some of those include Cafe Rio, Zupas, and Kneaders! My mom and I usually enjoy a few lunch dates to some of these favorites! I’m really not typically the type to order a salad at a restaurant, unless, it’s the shrimp louie salad from Market Street, or Kneaders Turkey Cranberry Salad! Have you ever had either of these? The Turkey Cranberry Salad at Kneaders is the BEST! Layers of lettuce, turkey, feta, craisins, and sunflower seeds doused in a sweet raspberry vinaigrette–it’s completely delicious! And since I don’t have a Kneaders near me in St. Louis, I decided to make my own from scratch! This recipe is so simple (and great when you have leftover turkey) and my whole family loves it! 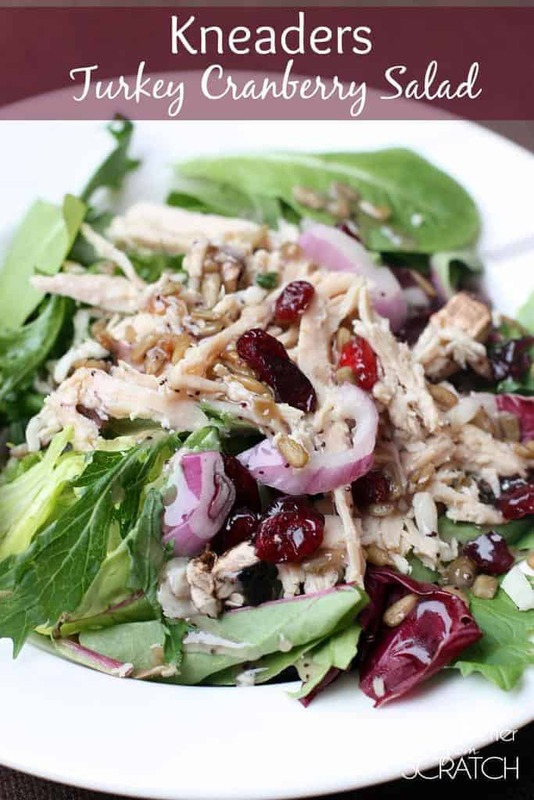 This simple copycat Kneaders Turkey Cranberry Salad is the BEST! Layers of lettuce, turkey, feta, craisins, and sunflower seeds doused in a sweet raspberry vinaigrette--it's completely delicious! In a large bowl mix together both types of lettuce. Add the onion, craisins, feta cheese, turkey, and sunflower seeds and toss to combine. Serve with Raspberry Poppy Seed Vinaigrette. In a blender, combine the vinegar, sugar, salt and mustard. Blend on low, and while blending, gradually add oil in a steady stream. Add raspberries, cover, and blend until smooth. Stir in poppy seeds. mmm I love kneaders, but haven’t ever tried this salad from them. It looks amazing though, can’t wait to make it at home! This is making me hungry for thanksgiving food! Sounds and looks delicious! I was addicted to this salad when I lived in Provo! Then I moved back home to Georgia and there are no Kneaders here (obv). SO GOOD! Thanks for sharing, pinning it and making it soon!! SSOOO GOOD! Just like the real deal!